Sorry, but you will need to enter some letters above before you can add them to your basket. What makes our collection so "Quintessentially British"? Why the Great British Coin Hunt? To mark the London 2012 Games, The Royal Mint struck a set of 29 designs featuring Olympic and Paralympic sports onto a set of commemorative 50p coins. A number of them also entered circulation. The coins were the talk of Britain amongst families, neighbours, colleagues and friends, capturing the imagination of the nation, as people from all generations checked their change enthusiastically for the designs they were ‘missing’ from their collection. Those who simply wished to obtain a full set for themselves had fun buying the commemorative coin editions for themselves. A year on from the games, 70% of the circulating editions had disappeared from the nation’s change, seized by would-be coin collectors for their piggy banks, collector folders and money boxes, indicating the popularity of coin hunting with the British public. ‘The Great British Coin Hunt’ provides a similar challenge to collect A to Z designs, struck onto the popular, easily accessible, 10p piece. How many coins are being made in 2019? 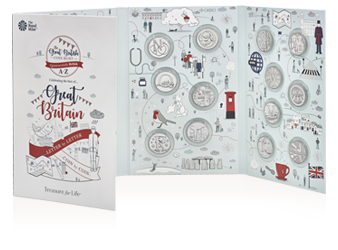 There is an unlimited mintage set against the collectable Uncirculated Great British Coin Hunt A-Z 2019 10p coins made. However, 2.1 million circulating versions of the coins will be released into circulation from February 2019. Why are you doing The Great British Coin Hunt again? The Quintessentially British A-Z 10p coins are back by popular demand and making a return in 2019 to allow the nation to continue to collect the series for another year. How are the coins displayed/packaged? Customers can purchase the collectable Uncirculated coins from The Royal Mint website as a coin only option where the coin will come in a zip lock bag. The coins are being presented in very basic packaging because we are encouraging customers place their coins in the special edition collector album. For customers wishing to make up special name displays, there are options such as collector albums and name frames available too. Can I still purchase the 2018 collection? Is anyone else distributing the coins other than Post Office? Yes. The initial coins going into circulation will be distributed through the Post Office network and cash distribution centres. In addition to this, you will be guaranteed to find them in your change, at The Royal Mint Experience.